1. Nappy cream. For sunburnt lop ears (GOS pig occupational hazard!) and for applying to cuts and grazes that all pigs get. Very cheap, soothing and antiseptic and it sticks - so that a pig can't shake it off her ears. 2. Disposable gloves. For iodine-ing new born piglet navels without staining your hands orange. And for applying nappy cream (see above) so that it sticks to the pig and not to you! 3. Outdoor eyewear. 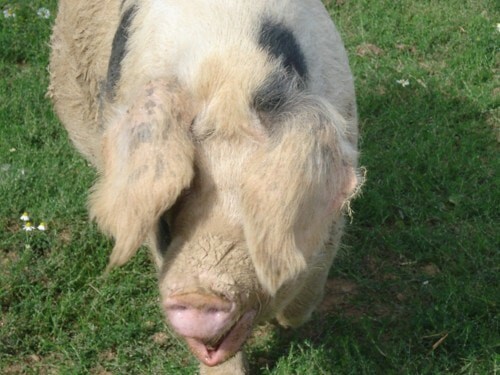 If you wear specs like me then they'll get scratched……this is a pig fact. Have a spare pair just for getting spattered in mud by a pig flapping her ears at you and for when you are raking out arks. Straw and dust might look soft and cosy but they are the enemy to your shiny new specs. 4. Nails. You need to put a bent nail into the top hinge of every gate to prevent your independently-minded pig from lifting the gate clean off its hinges and wandering off. 5.Time. To pat your pig and scratch behind her ears and chat about your day. Bliss.